In recent years, computer graphics has evolved into four major disciplines: computer animation, image processing, visualization, and virtual reality. Now these technologies are converging into one seamless digital medium resulting in various tools that will transform the way we work in the next century. Virtual Worlds on the Internet examines how the latest developments in virtual environments, computer animation, communication networks, and the Internet are being configured to create revolutionary tools and systems. Vince and Earnshaw have selected twenty papers they believe will influence computer systems of the twenty-first century. * Behavior descriptions used in expansive virtual environments. * Different uses of VRML in information system interfaces. * An examination of research in virtual reality environment interfaces. * Five approaches to supporting changes in virtual environments. * How ATM networks can support multi-user 3D virtual environments. * The transmission of vector graphics and animations over narrow-band transmission channels. * An exploration of an implicit modeling system including an interactive editor for building models. * A description of the advantages of 3D environments for shopping applications on the Internet. * The prototype of a software tool that automatically generates 3D models of virtual supermarkets. * A "VR Workbench" that displays strategic information viewable by a user groups. * An overview of a VR display system describing its workbench technology and its applications. * How to separate the functionality of a multi-user 3D modeling system into functional tools with interface specifications. 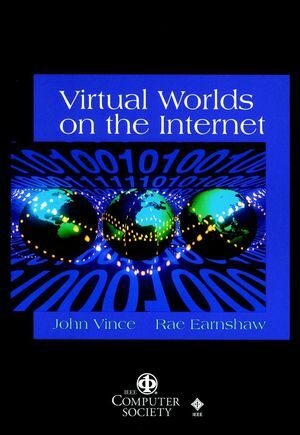 John Vince and Rae Earnshaw are the authors of Virtual Worlds on the Internet, published by Wiley. Chapter 1: Data Flow Languages for Immersive Virtual Environments (Anthony Steed, Department of Computer Science, University College London). Chapter 2: VRML Interfaces to Information Systems (Christine Clark and Adrian F. Clark, VASE Laboratory, University of Essex). Chapter 4: Ulysse: An Interactive Spoken Dialogue Interface to Navigate in Virtual Worlds (Christopher Godereaux, Pierre-Olivier El Guedj, Frederic Revolta, and Pierre Nugues, Institut des Sciences de la Matiere et du Rayonnement). Chapter 5: Information Drill-Down Using Web Tools (Mikael Jern, AVS/UNIRAS). Chapter 6: Generic Uses of Real World Data in Virtual Environments (M.W. Wright, G.C. Watson, and R.L. Middleton, Edinburgh Virtual Environment Centre, University of Edinburgh). Chapter 7: A Generic Functional Architecture for the Development of Multiuser 3-D Environments (Tao Lin and Kevin Smith, CSIRO Mathematical and Information Sciences). Chapter 8: Strategies for Mutability in Virtual Environments (Ben Anderson and Andrew McGrath, BT Laboratories). Chapter 9: Bringing the MBone to Web Users (Adrian F. Clark, VASE Laboratory, University of Essex). P. Latva-Rasku, Nokia Research Center (NRC). Igor Sunday Pandzic and Nadia Magnenat Thalmann, MIRALab, University of Geneva). Chapter 12: Interactive Cloth Simulation: Problems and Solutions (Pascal Volino and Nadia Magnenat Thalmann, MIRALab, University of Geneva). Chapter 13: The Blob Tree: Implicit Modelling and VRML (Brian Wyvill and Andrew Guy, Department of Computer Science, University of Calgary). Chapter 14: Automatic Generation of Virtual Worlds for Electronic Commerce Application on the Internet (Klaus M. Bauer, Computer Graphics Center (ZGDV e.V.). Chapter 15: A Case Study in the Use of VRML 2.0 for Marketing a Product (Nick D. Burton, Alistair C. Kilgour, and Hamish Taylor, Department of Computing and Electrical Engineering, Heriot-Watt University). K. Simarian and O. St?hl, Swedish Institute for Computer Science). Chapter 17: Collaborative Theatre Set Design across Networks (Ian J. Palmer and Carlton M. Reeve, EIMCU, University of Bradford). Chapter 18: Moving the Museum onto the Internet: The Use of Virtual Environments in Education about Ancient Egypt (William L. Mitchell, Department of Computing, Manchester Metropolitan University). Chapter 19: The Virtual Reality Responsive Workbench: Applications and Experiences (Lawrence Rosenblum, James Durbin, Robert Doyle, and David Tate, Virtual Reality Lab, Naval Research Laboratory). Chapter 20: Inner Space: The Final Frontier (David Leevers, Multimedia Communications, BICC Group).